We are delighted to introduce the RSP-2400 Series – 2,400 watt single output, enclosed type, switching power supplies with power factor correction (PFC) and parallel functions. Originally released in 2009, RSP-2400 has been updated to comply with the latest safety standards and, with state-of-the-art circuit design, does more than ever, better than ever. Primarily for use in 220V AC applications RSP-2400 has an AC input range of 180~264V and AC input active surge current limiting. Quick (±10%) fine-tuning of output voltage can be done by easy to reach rheostat on terminal face plate. There is also a "wide range trimming function" that allows output voltage to be adjusted from 20% to 110% of the rated voltage by adding 1~5.5V of external control Voltage. This provides engineers a great deal of flexibility with system design. 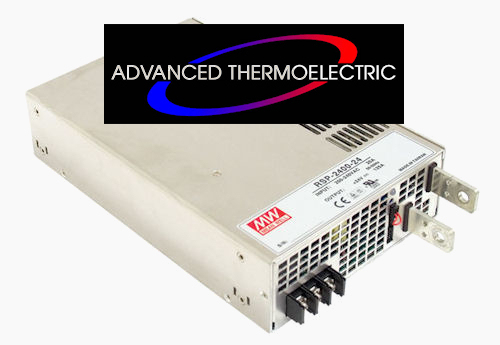 Having an advanced circuit design the RSP-2400 series are highly efficient (up to 91%) costing less to operate and can provide 2,400 Watts continuously in ambient temperatures up to 50 °C (122 ºF), or operate up to 70 °C (158 °F) with some power derating (see data sheets for curves). The high power density and 1U low profile will save precious space in final equipment packaging. Applications include front-end power systems, factory automation and control, industrial and military instrumentation, moving sign, telecom/data-com/signal, laser-carving machines, IC testing equipment, LCD panel burn-in systems and battery charging.